Seals cracks up to 1/2″ wide in asphalt or concrete. Remains flexible at low temperatures. Approximately 75-150 linear feet of 1/2″ x 1/2″ crack per gallon. An elastomeric polymer modified asphalt emulsion designed for filling cracks up to 1/2″ wide in asphalt or concrete pavement. Shake gallon jug moderately before using. Cut tip of spout to desired opening. 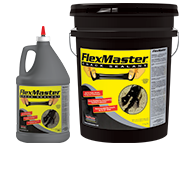 Fill crack completely with FlexMaster®. A u-shaped squeegee may be used to spread material flush to adjoining pavement surface. Material will skin over sufficiently to accept traffic within 4 to 6 hours after application. For best results, apply on dry surface when surface temperature is not expected to drop below 50°F. or exceed 120°F. in a 24 hour period. Do not apply when rain is imminent or forecast. KEEP FROM FREEZING. When not in use, keep container tightly closed and upright to prevent leakage. Do not store in direct sunlight or above 100°F. In case of spillage, absorb and dispose of in accordance with Federal, State, and Local regulations.